Navigation systems are great… as long as they can get a satellite signal. Without satellites, navigation systems turn back into the regular map from the past. Having your navigation system turn into a regular map halfway during a drive can be very discomforting and even outright dangerous for drivers. Therefore it would be best to prevent this situation from ever happening. The most obvious location where this happens all the time is in tunnels. You get a concrete slab and possibly several metres of earth between you and the nearest satellites, blocking your signal completely. Gil, an engineer at Waze, experienced this occurence first hand in a tunnel in Israel, making him miss his exit located inside a tunnel. Being an engineer, he looked over the various solutions out there and concluded there was still much left to improve. All available solutions are either expensive, restricted to certain devices, ineffective, high maintenance or all of the above. After quite a bit of testing, he came up with a low cost, open and very functional solution: Waze Beacons. Waze Beacons are bluetooth beacons powered by a battery (4 to 6 years lifetime) that need to be placed about every 60 metres in the area you want to get coverage in. These beacons constantly broadcast a signal that allows the receiving devices to pinpoint their location. This might seem easy at first sight considering that there are already bluetooth positioning systems out there, but those are always optimized for open spaces (generally malls) or made to work only in closed quarters and not in tunnels (metro stations). Waze has worked together with the industry leader of bluetooth devices Bluvision to design, produce and distribute these beacons. Waze does not get any profit from selling these beacons. These beacons are not reserved for Waze users only. The bluetooth signal and the broadcast IDs are available to everybody. As is usually the case with new technologies, there first need to be several tunnel installations before everybody will support it. With Waze’s backing though, this will almost certainly only be a matter of time. 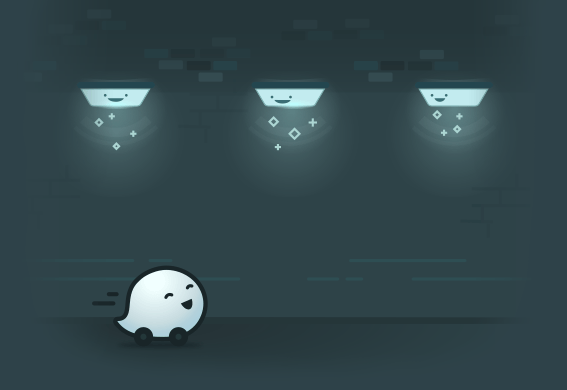 As can be expected, Waze Benelux has started promoting Waze Beacons at the several partners we have so they would consider adding these beacons to their tunnels.